James. 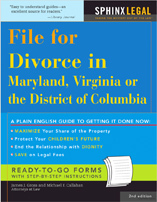 J Gross is the co-author of the e-book in PDF format called How to File For Divorce in Maryland, available for download today on DivorceNet.Com for $19.95. He has been selected by Washingtonian Magazine and Maryland Superlawyers as one of the region’s top divorce lawyers. Mr. Gross is a practicing partner in the Chevy Chase, Maryland law firm Thyden Gross and Callahan. He is the author of the blogs Maryland Divorce Legal Crier, The Daily Answer Desk, and Not Just Every Other Weekend and the e-mail newsletter In the Courts. Mr. Gross is a seasoned and experienced divorce lawyer and eminently qualified to answer your questions, provide legal assistance, and to speak with authority on divorce, child custody issues, child support, property distribution, alimony, and family law topics. We know that you will enjoy reading his insightful commentary and thoughtful blog postings. I am left with almost nothing, and I am now a pro se defendant against a lying, scheming, vindictive woman who seeks to destroy me and limit my time with my children. Thank you for the kind words and good proof-reading. I am happy that my blog gave you some assistance in your difficult divorce. Best of luck with your case.